Putin and Erdogan met in the early afternoon of August 9, 2016 in Saint Petersburg to discuss a variety of topics that have been waiting for months to be addressed. The discussion focused on the security and cooperation vital for the future of both nations. Many experts perceive this meeting to be the first step of an impending strategic realignment between Ankara and Moscow. As seen over recent events in northern Syria, Turkey is more than ever an active and vital component of the massive operations launched by terrorists to regain parts of Aleppo and break the isolation imposed by the Syrian Arab Army. A highly ambiguous factor in interpreting Erdogan’s purported change of mind on Syria surfaced a few hours after the coup ended in failure. More than one news agency very close to the Iranian National Guard (IRGC) recognized the withdrawal of several Turkish military instructors from Aleppo as a signal from Erdogan to Damascus and Moscow. Some even suggested it was the beginning of a strategic shift in Ankara’s foreign policy following the failed coup. Only in the coming days will the situation more fully reveal itself. The instructors were evacuated as the Syrian Arab Army approached Aleppo in preparation to launch a powerful assault. Ankara simply removed their assets in order to avoid having to explain their presence. But the reality is that Russia and Turkey are on two differing and opposing trajectories. Moscow and Ankara will not begin to have common ground for cooperation before, in particular, northern Syria is completely isolated from the flows of weapons and men that stream across Turkey’s border. All these frictions, however, do not prevent an attempt to find a strategic agreement between Turkey, Russia, and even Iran, in the medium to long term. In this sense a lot can be understood from Erdogan’s words in his recent interview given to Russian news agency TASS. First he reiterated that «Iran could be involved in negotiations on the outcome of the conflict in Syria». Then, continuing on a strictly economic level, he said that «Russia and Turkey must finish the nuclear power plant (output 4,5GW) construction in Turkey». Another aspect, very controversial given its strategic importance to the European Union, relates to pipelines: «Russia and Turkey need to accelerate the construction of the Turkish stream». Geographic proximity oblige Moscow and Ankara to have dialogue. 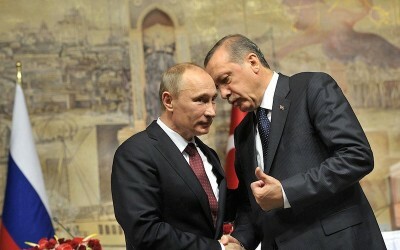 Equally obvious in the short term will be the enormous difficulties that Erdogan and Putin will have concerning Syria. The reality is that their strategic interests diverge on a significant amount of points, especially, but not limited to, Syria. The stunning words declared by Erdogan in his TASS News Agency interview serve to highlight this, from the most typical – «Assad must go, there is no other solution to the Syrian conflict without his departure» – to the astonishing – «Al-Nusra Front should not be regarded as a terrorist group». The only common ground – one that should not be underestimated – is the need for all regional actors (Turkey, Russia, Iran) to hold together the Syrian Arab Republic in order to avoid a flare up of the Kurdish issue. It should be kept in mind that this interest has been systematically undermined by the ambitions of such countries as Turkey, Qatar, Saudi Arabia and the United States in seeking to overthrow the legitimate government of Bashar al-Assad. We must keep in mind that it is more than normal for the heads of state of Turkey and Russia to meet, especially at this particular historical juncture. Too often we confuse geopolitical ambitions with economic needs and requirements. In this sense, the relationship between two nations such as Russia and Turkey serves to highlight this. The growing need for Ankara to influence events in Syria has prompted Erdogan to an intense strategic alignment with Saudi, Qatari, Israeli and American interests in recent years. What is interesting to note is the red line that the shooting down of the Su-24 represented for Moscow, as it was not until that moment that Putin decided to act on an economic level against Turkey, applying sanctions and restrictions on trade. Naturally this had limited impact on the Russian economy, but Turkey suffered heavily economically. Putin decided to deal with Erdogan sharply on an economic level in order to maximize pressure following the downing of the military aircraft. Putin and Erdogan meet to restore economic cooperation, which for several reasons is the right move for both. Erdogan cannot fight everyone at the same time: he is reduced to having almost no friendly relations with any head of state. Putin, on the other hand, needs Turkish Stream to be able to apply pressure on the European Union, especially with regard to pipelines and Ukraine. In such a situation, the need for ongoing dialogue between regional actors is constant, and when absent for several months, ends up counterproductive for all concerned. It is in this context that the meeting must be seen, which is very different from the assumption that alliances are being formed with a future common strategy on Syria. And, furthermore, make no mistake: the geopolitical unrest between Turkey and Russia is not going to end soon. This is easily understood when listening to the press conference of Putin and Erdogan. First, they discussed business, and only after that did they speak about Syria. There is very little common ground for any kind of alignment on that matter, and the press conference clearly was also aimed at giving a good impression (to NATO and Washington above all) of cooperation on a broader array of issues. When Putin and Erdogan were speaking about energy deals, they were aiming at the EU and to some extent at the USA. This meeting, the way it was structured, and its related press conference were carefully orchestrated. However, it also explains why on a geopolitical level little will change, especially in Syria. Put simply, it is almost impossible to achieve any kind of agreement between the parties on ending the conflict. This is why the idea of a Russo-Turkish alliance in Syria seems like an exercise in confusion rather than in providing a proper explanation of the situation. The evidence shows Russia and Turkey adopting often divergent and contrasting policies designed to defend, from their respective points of view, «vital national interests».